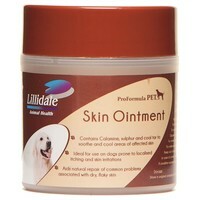 Lillidale Skin Ointment for Dogs is ideal for use on dogs prone to localised itching and skin irritations. Containing calamine, sulphur and coal tar to soothe and cool areas of the affected skin, Lillidale Skin Ointment also aids natural repair of common problems associated with dry, flaky skin. Calamine, Sulphur and Coal Tar Solution in an ointment base.